Dynmap-WorldGuard provides a simple way to add visibility of WorldGuard regions to Dynmap's maps. The plugin depends on the presence of both Dynmap and WorldGuard, and interacts directly with the WorldGuard API. Updates to zones are automatically updated (on a settable period - default is once per 5 minutes (300 seconds)). By default, the plugin will be active after simply installing it (by unzipping the distribution into the plugins/ directory and restarting the server. Visibility of regions can be controlled via the 'visibleregions' and 'hiddenregions' settings. Besides listing the names of the regions to be made visible or hidden, entries with the format 'world:<worldname>' can be used to make all regions on a given world visible or hidden. Also, the display of the region outlines can be restricted to a minimum zoom-in level, via the 'minzoom' setting. When non-zero, this setting causes the region outlines to only be displayed at or beyond the given zoom-in level. Note: If you are currently using the region component for WorldGuard in Dynmap, you should disable that support while installing Dynmap-WorldGuard. can this be updated to 1.13.x ? We have literally thousands of regions on our main map but with worldguard 7 the dynmap-worldguard plugin broke. Worldguard and Dynmap both work but no regions are highlighted and no directory called Dynmap-Worldguard is created. For those wondering, the latest version of Dynmap-Worldguard (v0.90) seems to work without issue for 1.11.2. Do you think there might be a way to add a parameter in the config to allow merging of children regions? When set to true, a region border would encompass all its children and would be displayed in 1 entity (if possible). The plugin doesn't work in 1.9.4 and 1.10 :(, any scheduled update? Any progress on a 1.9 version? This is the only plugin I have left that isn't 1.9 compatible. 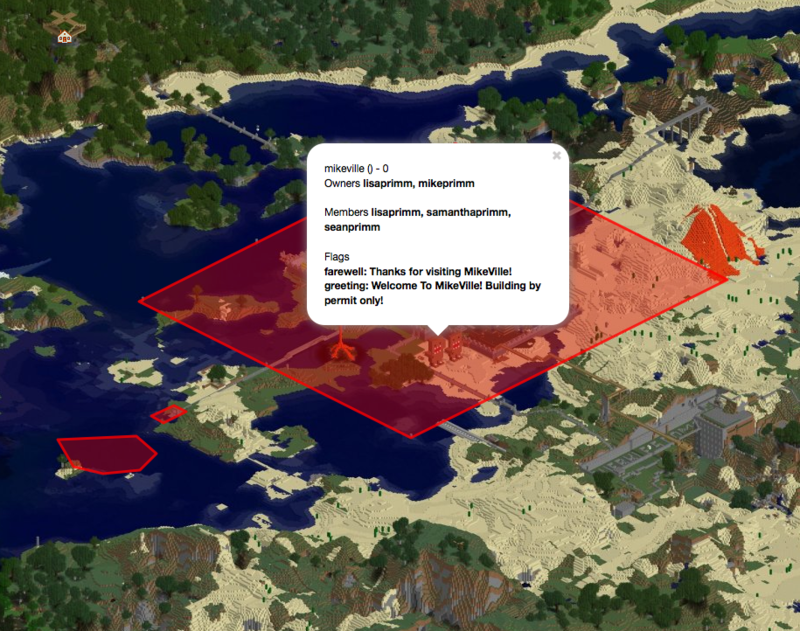 First dev builds for Dynmap itself, with support for Spigot/CB 1.9 are currently available (see 2.3 SNAPSHOT athttp://dynmap.us/builds/dynmap/). I'm hoping to have it tested and released (including support for the new 1.9 specific blocks) by Sunday. Where is the updated jar for this fix? There is a pull request with a functional fix out coloring owned regions with the right color. So I guess this plugin is dead? Not been updated since December last year, emails, tickets and comments go unanswered. At first the plugin did not want to load, now it does but there is no layer on the dynmap nor can I see any of the sections? Anyone?